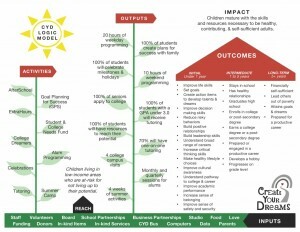 Logic models were first developed in the 1970’s and are now popular among corporate, foundation, and government funders. Download Cultural Data Project’s Logic Model Worksheet. While these models require more analysis than other donor communications, there’s no need to panic. 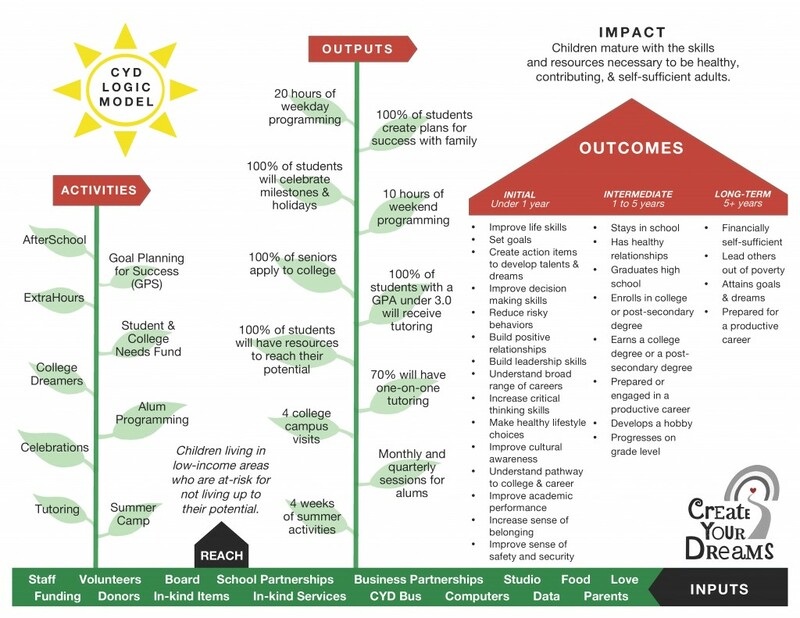 Developing a logic model offers an opportunity to build a shared framework of analysis within your organization, articulates the strategy your organization is using to address key issues, and ensure donors at all levels understand how your organization’s work is making a difference. Inputs are all of the resources you use to successfully run your programs. In the example above, some inputs (pictured as the grass at the bottom of the image) include business partnerships, in-kind services, computers, and parents. Create Your Dreams also specifically listed the population they target, which is children living in low-income areas. Questions to ask: At your organization, how many staff members work on the project? What kind of equipment do you use? Include staff and board time, funding, and any partner organizations. Activities are what you do with the inputs. On the left-hand side of the image above, the program activities are pictured as the leaves on a plant. Questions to ask: How are resources used at your own organization? What programs does your nonprofit manage, produce, or create? Outputs quantify the activities and the number of people they reached. In the Create Your Dreams logic model, outputs are listed on the second plant. Questions to ask: Last year, how many people took part in programs at your organization? Don’t forget, outputs should always have a measurement attached to them. Outcomes look at what changed for your participants because they experienced or participated in your activities. In the example, they’ve divided outcomes into three different categories, ranging from initial outcomes (such as improved life skills) to long-term goals (for example, that children who took part in the program have become financially self-sufficient). Questions to ask: After taking part in your programs, did your participants have a change in outlook? Did their behaviors change? Question to ask: What is the large-scale change you are trying to create in the world? Let’s dig a little deeper into outcomes and impact. Depending on the grant you are applying for, you may be asked to report back later about your progress towards the outcomes listed in the logic model. If that’s the case, you’ll need to figure out whether you are already collecting the data you’ll need, or if there are any new systems you want to put in place so that you can measure your progress. Sometimes, it can be difficult to assess an organization’s impact if the intrinsic value of activities are perceived as more important than the outcomes they create. If this describes how your organization views its work, take the time to flesh out the full vision of the change you’re working towards. This can lead to greater buy-in with your team and help staff make strategic decisions. 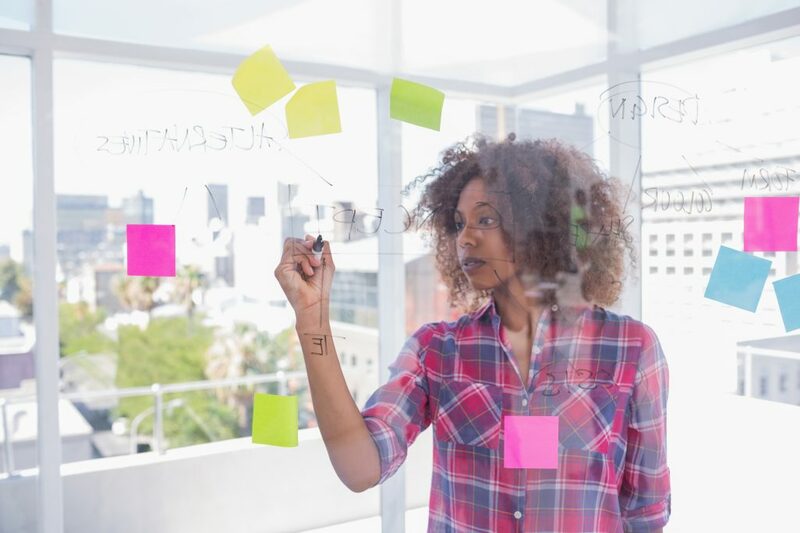 Involving your colleagues in the process and sharing the results with your entire organization, can put tasks and projects in the context of the bigger picture and help you focus your programs. To learn how logic models and similar tools can help a nonprofit like yours, check out the story of the Santa Cruz Museum of Art & History. This webinar is also a great resource because it highlights how adding data to the stories in your annual appeal can prepare you to produce a logic model.